30 cpm once upgraded to solo. Traing pay is $400.00 per weeks. Training is 240 hours OTR with a trainer. I don't know exactly where you live or call home. My personl advice from experience is to make sure when choosing your next company is that they have a terminal or satellite terminal near your house. This should make getting home a piece of cake. I took this approach and now I'm home almost every other day and still making decent pay. Riding through the Salt Flats of Utah for me. I loved the majestic clouds and how they gave off the illusion of being closer than they actually were. Truckers usually idle trucks when they don't have APUs. During the peak of winter and summer if you don't havs an APU, you either idle the truck or freeze or burn to death. Get well soon and get back to cranking out those miles. Stevens Transport and Titan Tranfer both have facing cameras. My nephew works for ACT (American Central Transport) which also has facing cameras. Sorry to hear and prayers are with his family! I was so upset when this event happened that I almost quit trucking all together. No amount of money can erase the pain suffered from the families and the driver. The Cascadia has a superior turning radius and more room in cab and sleeper. The T680 IMHO is much smoother at shifting and accelerating. 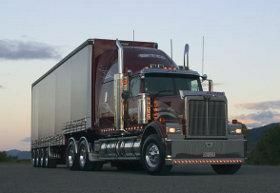 I started out with a T680 with my first company and now I'm in a Cascadia. Overall both are good trucks but I'm partial to the 680. Most people with ambition will always look ahead for greener pastures. What works for you today may not work for you tomorrow. If your not content with your current situation after gaining experience you have the right to exercises your options. I was a Mortgage underwriter and been in the Mortgage and lending business for 18 years. Made good money but once the economy took an arrow to knee so did the housing market. Got tired of the lay offs! I went to the location in Conyers last year. It is an accelerated program. One week study to obtain your permit and next week is practicing driving, backing, pre trip to obtain your CDL. 2 weeks basically. I don't want to do 65 (Or under) for my career.. I just started with Titan Tranfer about three weeks ago, our trucks are governed at 72. It feels great not being the slowest truck on the hwy anymore. I drove a 62mph truck for over a year. I made the most of it, but I don't want to go back to being that slow. Caroll Fullmer fleet is mostly Mack but they're a South East Regional Company. I've never driven one so I have no performance opinion. They look very nice, alot better than Internationals IMHO. Freightliner Cascadia is your best bet. I'm 6/7 and feel very comfortable in the sleeper. What truck would you choose? Backing will be situational depending on space an time. Sometimes it will be pull throughs and straight line back. As the day get later and the spots fill up you will most certainly have to do a 90 to get in the last few spaces. 90s and 45s are key at shipper and receivers, because sometimes you'll have to dock between two trucks in tight spaces. Don't worry you'll get practice. Be safe and keep it in between the lines. It's really feels weird driving a car after months of big rig driving. Sitting so low and not having the high vantage point drives me insane. You guys have pretty much covered all the basis of forgetful automobile driving. One thing to add is that I forget all about the rearview mirror when driving a car, I find it hilarious looking out of the convex. Trucking has definitely made me a better driver. Before trucking I never really put much thought into the daily maneuvers of driving. Sliding tandems for docking...do you?